Includes a $220 credit with Live Well 30A. Choose from4 free bikes, free beach service, free 2 day SUP rental, or towards dozens of other great Live Well 30A rentals or services! This beautiful beach home is in Seagrove nestled between the communities of Seaside and Rosemary Beach along the emerald waters of Hwy 30A. Everything you could want in a seaside experience awaits you in this ample 2500 square foot home tucked within Cassine Village, one of Seagrove’s best family-oriented neighborhoods. Our vacation home has been lovingly cared for and we know you will feel right at home the moment you walk through the french doors. With three large bedrooms on the second floor and master on the main floor, this house has the perfect layout for your extended family and guests. The oversized living area is a rarity in this area and seating is ample. A roomy, well-stocked kitchen is a plus along with dining space for 11, a convenient outside shower (that does have hot water!) and laundry room side-entrance. The laundry room also has an extra fridge! Please join us. We hope you’ll make our home your retreat this summer. The home was very nice. The walk to the beach is about 5 minutes. I would recommend a deep cleaning of the home. I would also highly recommend replacing the pots and pans. They were very worn and dirty. For the rental cost, I would expect an immaculate home. Thank you for taking the time to submit your review! We will certainly be looking into the items you have mentioned - we do appreciate the feedback and will do everything we can to ensure that the property is clean and well equipped. You are certainly right about the location of this home - close to the beach and several great eateries but nestled in a little neighborhood that feels like home! Lots of space for relaxing with your family and friends - you are sure to make memories that last a lifetime at Key Lime Pie. Call Benchmark today with any questions and let us set your vacation dreams in motion! Key Lime Pie was great. The house was very clean, the kitchen was very well stocked w/everything you need to feel at home. This home is very spacious & very well decorated. The beds are very comfortable & bathrooms stocked w/plenty of bath towels. We loved sitting on the screened in porch talking & drinking our morning coffee. Great location across the street from the beach access (a short 5-7 minute walk). Walking distance to restaurants, beach store, ice cream shop & donuts shop. Quite family oriented neighborhood, w/very well maintained streets. 2 very nice & clean pools. Highly recommend this lovely home. Thank you for taking the time to submit your review! We are so glad your stay at Key Lime Pie was enjoyed!! This truly is a beautiful home in a beautiful neighborhood! A nice easy stroll to the beach or nearby restaurants, the location is very convenient. Relaxation is the name of the game at Key Lime Pie. 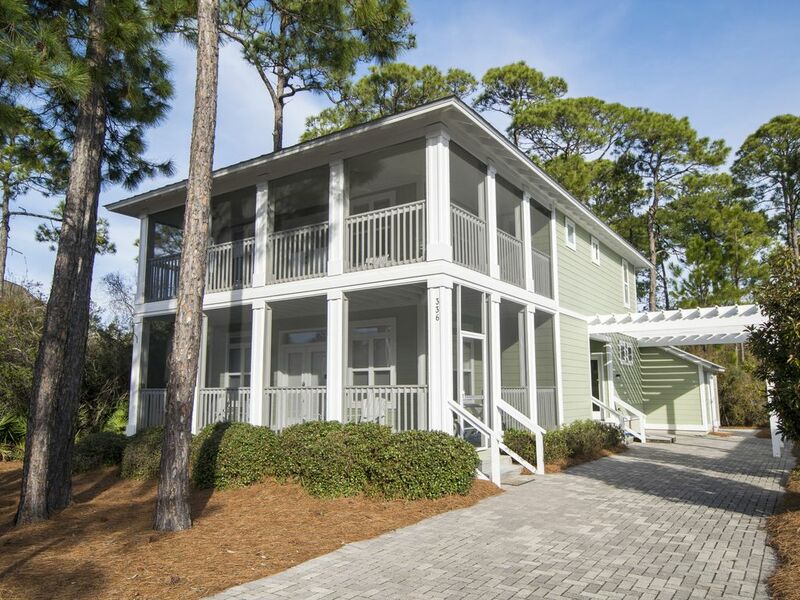 This home is built for comfort whether you are sleeping, hanging out in the lovely living space or enjoying your morning coffee on the screened in porch this will be a vacation remembered! Call Benchmark today for your Key Lime Pie experience! Thank you for leaving a review - we are so glad you enjoyed your stay at Key Lime Pie. You are right - this is a spacious home! Plenty of room for mom, dad, grandma, grandpa and the kids! What a wonderful place to create some new family memories at the beach! This home is located in the Cassine Village neighborhood - very quiet and quaint! And just a quick walk to the beach and relaxation! Located in the heart of Seagrove Beach - you are never far from superb dining and glorious shopping!! Want to take a dip in the pool - just a quick walk to the community pool as well! Key Lime Pie is the place to be - call Benchmark today! We loved the property, and the quiet neighborhood. Not too far from the beach, bike rental, and nail salon! Comfortable beds, spacious living quarters. Enjoyed this home and look forward to next year. Thank you for submitting your review - we look forward to having you back! We couldn't agree more - there is so much to love about this home! It truly is a great place to enjoy with your family as you make memories that will last a lifetime! There is something for everyone - quiet, quaint neighborhood, close easy access to the beach and close to fabulous restaurants! Key Lime Pie may be the perfect fit for you and your family so give us a call today to see if we have your dates available! House was as advertised . Easy walk to beach. Close to shops & restaurants. Grocery store was nearby-easy drive. Bicycle rental was no problem. So, the house was a winner and all 3 families who shared it want to come back!! Thank you for submitting your review!! We are so glad you enjoyed your stay at Key Lime Pie - this is a truly wonderful house! It has so much space which makes it ideal for multiple families - there is plenty of room where everyone can hang out and the memories can be made! The beach is close, the pool is close as are all the other amenities you have mentioned! This is a very popular home in a quaint, desirable neighborhood so please call today to reserve your little slice of heaven at Key Lime Pie! It was the perfect home for our family. Loved the location and amenities. We will come again!! We are so glad to hear that your family had a wonderful time! This is such a great home for entertaining! We can't wait to see your family back at the beach soon! No pets and no smoking. Must be 25 to rent. Summer rentals are Saturday to Saturday with 4pm CST check in and 10am CST check-out.